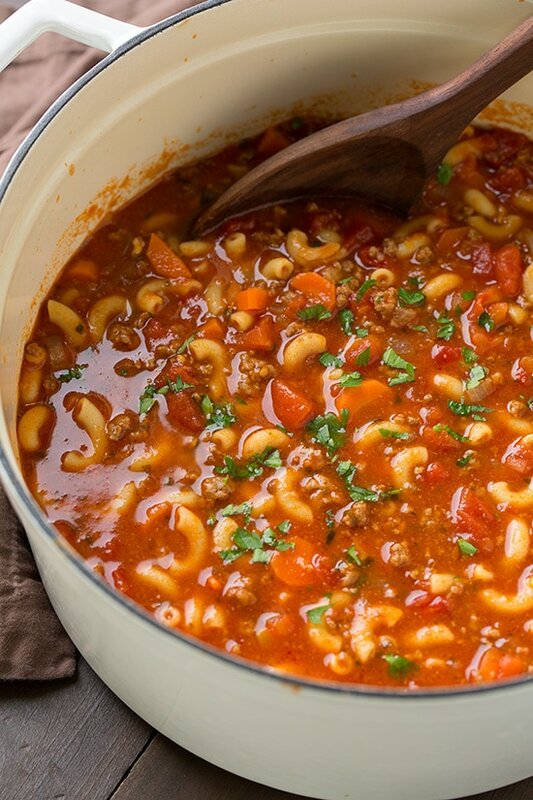 Beef and Tomato Macaroni Soup is one of the most comforting soups out there! 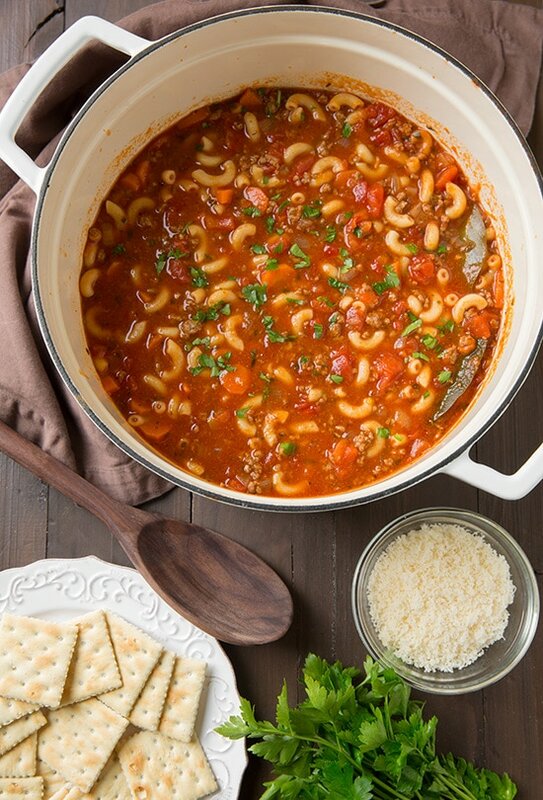 It’s filled with flavorful, pieces of grounnd beef, sweet tomatoes, hearty macaroni and a herbed broth. Destined to become a dinnertime staple! 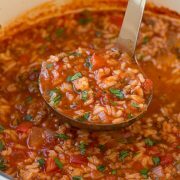 This sou pis just like what we had as kids called “Goulash” or “Cowboy Delight” in soup form. And lets be honest, what kind of names are those for a dinner meal? Definitely not the classiest, but that doesn’t really matter I guess does it? What really matters is that this is one hundred percent, homestyle comfort food right here. Just like what mom used to make. 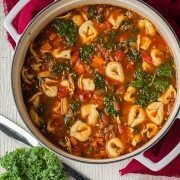 Yes, I love the stuff and I was out to prove it can be delicious, so today I’m sharing my version that’s a step up from some of the sugary ketchup versions your mom may have made :). Also, if you are like me and can’t resist, feel free to stir in some frozen corn during the last few minutes of cooking to keep it authentic. This is a meal your whole family really will love. This is people food. Yes I love a really fancy meal on occasion but more than anything I just love the classics. 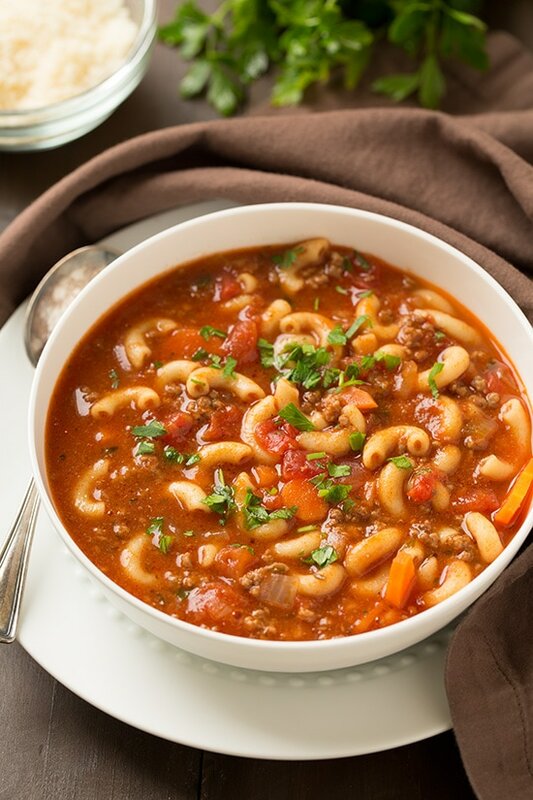 Beef and Tomato Macaroni Soup is one of the most comforting soups out there! 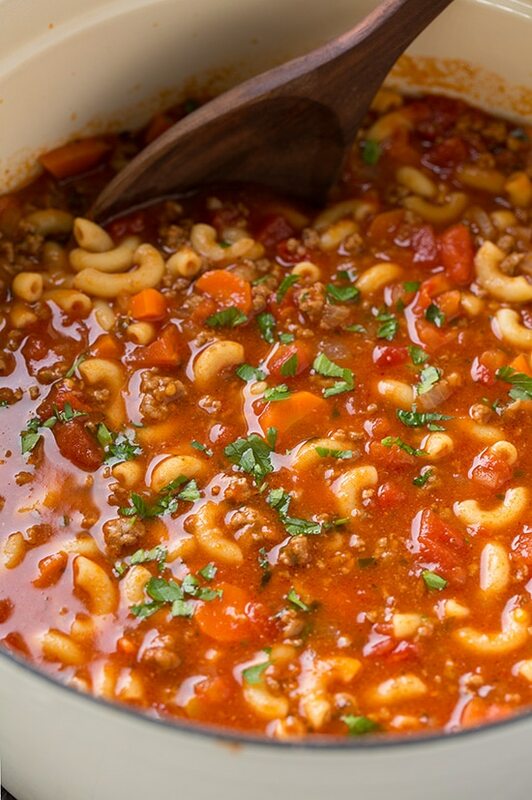 It's filled with flavorful, pieces of grounnd beef, sweet tomatoes, hearty macaroni and a herbed broth. Destined to become a dinnertime staple! Heat 1 Tbsp olive oil in a large pot over medium-high heat. Add onions and carrots and saute 3 minutes then add garlic and saute 1 minute longer. Pour mixture onto a plate. Heat remaining 1 Tbsp olive oil in pot over medium-high heat, add beef, season with salt and pepper and cook until browned. Drain fat from beef. Return sauteed veggies to pot along with beef broth, tomato sauce, tomatoes, Worcestershire, marjoram, thyme, bay leaves and season with salt and pepper to taste. Bring to a boil. Add in pasta, cover and reduce heat to medium,. Boil stirring occasionally, until pasta has cooked through, about 15 - 20 minutes. If adding corn, stir in corn during last 3 minutes of cooking. 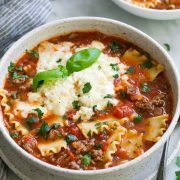 Remove bay leaves, serve warm garnished with fresh parsley and parmesan cheese if desired.